A horrible human rights tragedy has been occurring in the “land of the free”. It is difficult to know what to do or how to alleviate the pain and suffering of the victims. The problem is exacerbated by the fact that this human rights violation is perpetuated by the very institution that was supposedly created to protect personal liberty. The guilty party is the US Federal Government followed by each state government that participates in such immoral acts. Ultimately, the actions fall on each individual who blindly follows orders and aggresses upon peaceful people and the person who has imagined he has a higher claim to another person’s life. The stories never cease: a toddler dismembered, accidental killing of an innocent person or dog, children and adults denied life saving medicine for fear of being caged. Peaceful people who were acting well within their rights are kidnapped, their property and lives stolen, alienated from their family, to live out the rest of their life behind bars. Recently, another story has crossed my path. It is that of Darrell Hayden. He is currently serving two life sentences for growing a plant…marijuana. That is all. He has never harmed anyone. His daughter, Lisa, says he was a caring man who often helped those in his community. She said that he helped older people in the area by checking on them and doing small jobs. “Mostly, I remember he was always giving to his friends,” she said. Darrell is victim of the “three strikes” rule. He was convicted of growing marijuana twice. The first time he served 60 days, the second time he served 5 months. It went from that to two life sentences. While any time served is hardly justifiable, two life sentences is an absolute travesty. Making a difficult situation worse is Darrell’s heart condition. He underwent bypass surgery in November and his family was not notified beforehand. A time when a man needs his family nearby he was denied that right. His “crime” does not justify living the rest of his life in a cell, being moved from state to state with little to no contact with his loved ones. Darrell was born and raised in Loretto, Kentucky. He graduated from St. Francis High School, and in June of 1968, he enlisted in the Army. He served a tour in Vietnam. After returning home, he worked at the Ford Motor Company, did farm work, constructed small buildings and raised horses. Darrell is currently in the 16th year of his sentence. 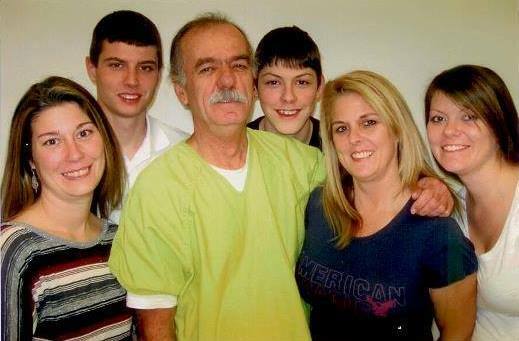 He has four children and many grandchildren, some of whom have only known him being in prison. Based on the guidelines of the Clemency Project (https://www.clemencyproject2014.org/), Lisa and her cousin created a petition (SIGN here) seeking clemency for Darrell. While the petition has already been submitted with over 40,000 signatures, they encourage anyone interested to still sign it. They have also created a Facebook group. While there are so many victims of the War on the Drugs, this case is particularly disheartening and unjustifiable. I encourage you to share this story. It represents so many others whose basic rights have been violated, whose families are denied precious time with their loved ones. Growing cannabis is not a legitimate crime. Stealing a peaceful person’s life is. This entry was posted in News, Opinion and tagged cannabis, darrell hayden, Kentucky, life for marijuana, war on drugs. Bookmark the permalink.